“Boston Billy” knows what he’s talking about and he’s a winner of this race. 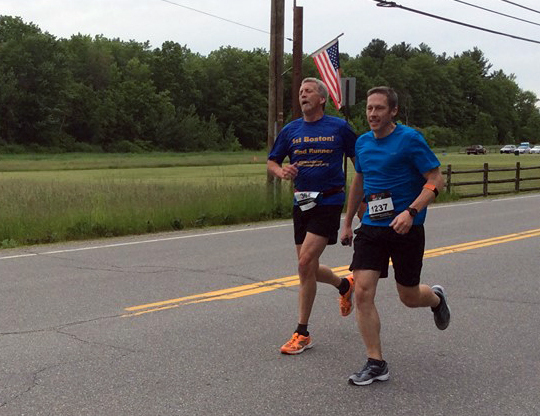 I’m just someone putting a little personal grit on the line as I try to run out a race pace near the 4-hour mark each year. After opening with a 3:50:37 time, I felt this would be a building block and instead it has been my personal best. Various challenges have set me back tremendously, including last year’s disappointing DNF when I made it past the top of “heartbreak hill” before allowing reason to guide me off the course with all the warning signs of hypothermia being confirmed in the medical tent. In fact, I’m astounded at how many more times the Marathon has humbled me, despite months of hard work preparing. 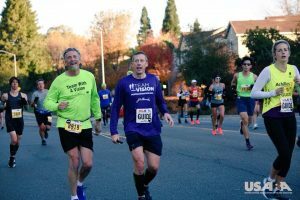 I have many finishes and several good finishes, but more struggles than I would have preferred and a complete respect for what it means to run this distance with purpose and determination. I’m back for my fifth consecutive Boston Marathon with a strong training regiment behind me to hopefully bolster me to a worthy finish. Text RUNNER to 234567, and you’ll receive up to 9 text alerts, including 7 on race day! 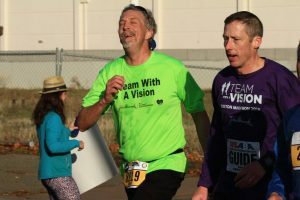 As usual there’s several teams involved in my making this 26.2 mile journey and it starts with the guide who has chosen to steer me around the myriad obstacles along the course. Rodney “the Throttle” Andre has become a great friend as well as excellent guide as we’ve navigated our way through hundreds of training miles, a National Marathon Championship, and our share of challenges as well. Snow, ice, potholes, inattentive cars, gusting winds, freezing temperatures, driving rains, and somehow he finds the way to guide my spirit as easily as he guides my steps. His mischievous smile is visible to my totally sightless eyes and our laughter often echoes across the hills we run together. Thank you, Rodney! 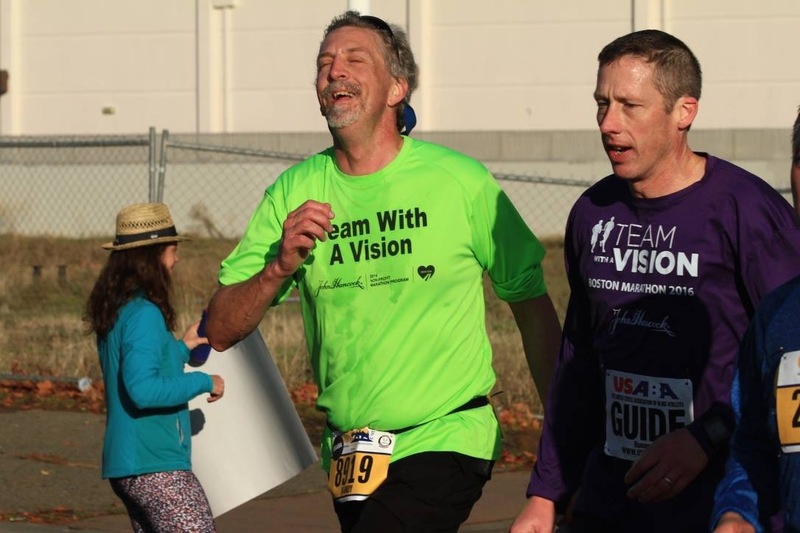 “Team With a Vision” is the incredible group of runners, guides, and coordinators instrumental in supporting the blind and visually impaired runners from all over the world as they embark on their Boston Marathon quest. Better still, their efforts are similarly directed to enhance the support they provide to thousands of VI people throughout the state of Massachusetts. This is my fifth time proudly joining their ranks and appreciating the work they undertake every day, the race day support, and perhaps best of all, the community they build and sustain around this epic marathon. This year I hope the weather will be good enough to showcase the TWAV running gear I will proudly wear for the race. One final closing connection I want to share as I prepare for the two weeks of excitement ahead: I belong to a running club in Nashua, the Gate City Striders. The many members of this community have provided significant support, guidance (often literally), and friendship through my short time with the club. I have built many great friendships which go well beyond our running, training and encouragement. On race day morning I’ll share more about the training involved in getting to the start line and hopefully past the finish line, but as important as all of the work are the people who help make it fun and for me often possible. Thank you to my fellow striders including my favorite strider and absolute best support in this as in all things, my wife Tracy!